Theme park jail is a grim place. 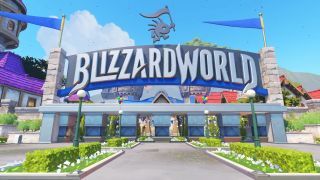 Blizzard World, Overwatch’s theme park map, is out of commission after it trapped its guests/combatants inside the spawn room. Overwatch’s Winter Wonderland event kicked off yesterday, but instead being able to frolic in the newly festive arena, many players were imprisoned by obstinate doors. Others couldn’t move their payloads. Spawn rooms were turning into jail cells frequently enough for Blizzard to shut Blizzard World down. Arcade modes that include the Blizzard World map, No Limits and Mystery Heroes, have similarly been disabled, Blizzard announced on Twitter. On Reddit, players also reported problems with the payload not moving. It gets stuck at the entrance as if it was contested, even if only one team is near. That hasn’t been addressed by Blizzard yet, however. It’s been almost a day since Blizzard World closed its doors. The world mourns.